I'm making some changes around here to the crafty area of our house. I noticed that Ali has changed her office recently and added some laminate floors. I really loved when she painted her walls white and I'm planning on doing that in my room but for now-blue will have to do. 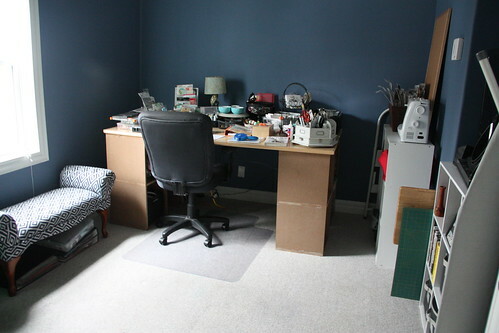 This is what I'm starting with-blue walls, high ceilings (insert small leak here), carpet. There's a plan for white walls, high ceilings (insert NO leak here), hardwood or bamboo floors. So we need to get that little leak issue fixed before we move on throughout the cosmetic areas of the room-no flooring or paint is going in there until that's been resolved. I have been doing other things though. 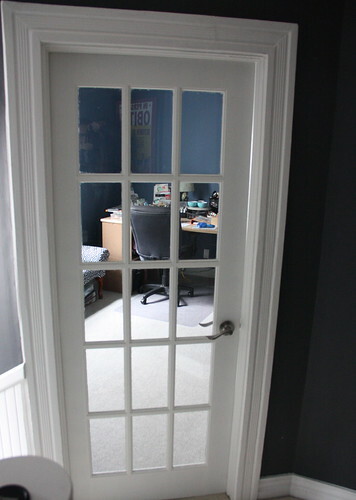 I changed out the door from a solid wood door to a French door. I picked it up at a salvage shop and had to prime & paint it and then of course scrape it too. I also changed out the handle for something a little prettier. 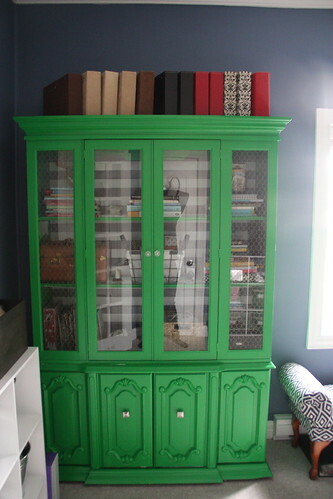 Another addition to the craft room is what we've been lovingly referring to as the 'Green Giant'. I found this dining room cabinet on kijiji for *Free* and after some new paint, a little background wallpaper and new knobs it's been refreshed! 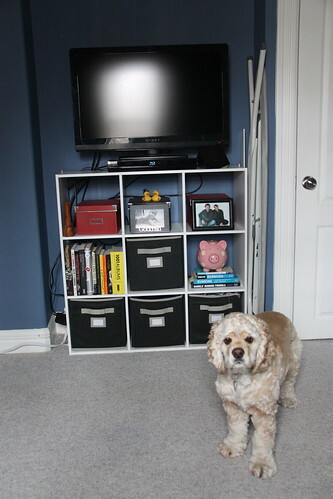 It's become a place to store books, projects and old scrapbooking albums. In the cupboards below are things like extra supplies and old photos, etc. 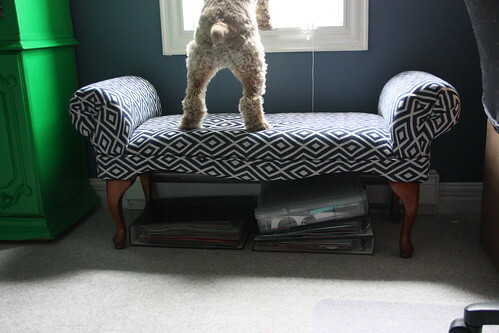 I also purchased a queen ann bench from kijiji and reupholstered it for Eugene. 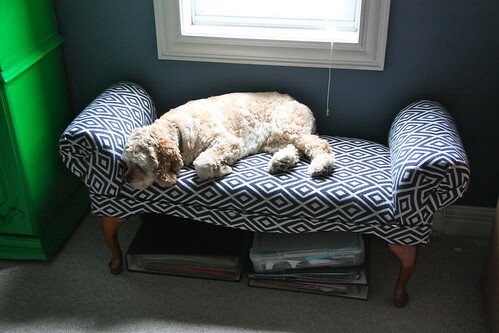 It's a great perch for looking out the window or snoozing while I work. I've done a lot of organizing in the last week as well. 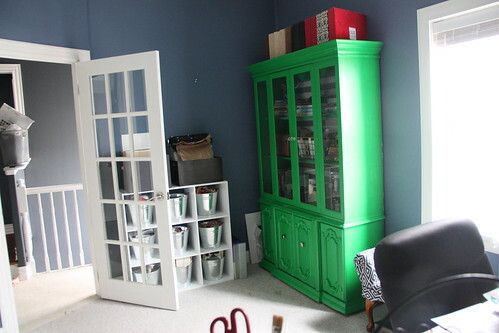 After the 'green giant' entered the picture I decided to change up some of the storage areas of the room. 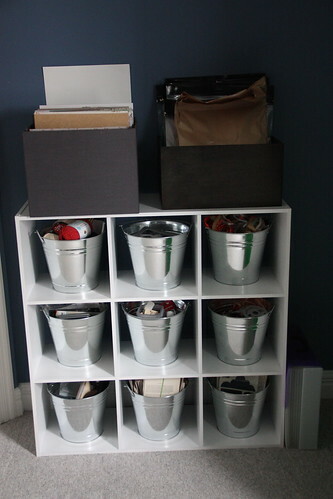 I picked up 9 sliver galvanized pails at the dollar store for storage in my white little cubbie. I'm planning on adding some Martha Stewart chalkboard labels on them to identify what's in them-knitting supplies, ribbon, mini album pieces, etc. I also picked up a new container to separate my kits from my 12 by 12 paper. I also moved my entertainment to the little alcove. There was also more room for storage so I'm storing some DVD's and sewing supplies in the boxes and bins. 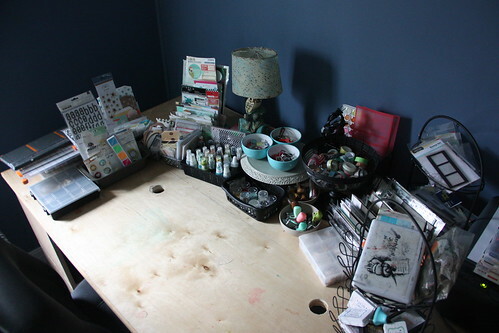 When rearranging my scrapbooking table I couldn't handle all the different color containers. So I took the spray paint can to them and painted them all a matte black. Now they all blend-even the cheap plastic ones. I also moved some things to the back and, on a suggestion from my friend Cathie, hauled out a few old loaf pans for some smaller supplies. I also put away a bunch of stuff that I don't usually use. I figure if I need it I'll go get it and if not, then it should be donated! This desk was made for me by M in the Fall and it's getting a little mini-makeover as well eventually. I'm planning on painting the bases on the outside and maybe a different color on the inside. And the walls-well I have so much I want to do on the wall-especially the space above the desk. A giant photo collage or a long floating shelf with a combo of DIY projects mounted on it and above it. I'm thinking of putting it right above my table. I also need a calendar and a clock. It will all be lovely when it's all done. I've done a lot of sitting and thinking and just looking at how I want it to be set up so that I am inspired creatively. Anything new in your room lately? I'll keep you posted on the progress in my room! I would be happy if I had painted walls of any colour! I'm in the storage/freezer room of a partially finished basement - which means I'm in the unfinished part! Love what you're done though - it looks fabulous! It's looking gorgeous - love the green unit and the couch...it looks great.